THE TRUE DEPTHS of the scandals at the EPO are yet unexplored. Benoît Battistelli never ceases to amaze, having just broadened his secret PR contracts. To make matters worse, Battistelli’s EPO is now buying the media. How long before this blows up both in the face of the media and in the face of Battistelli? There’s moral/ethical breach here. It’s sometimes considered to be journalistic misconduct. “It’s institutions like the EPO (once run and ruined by Battistelli) which discredit the EU (even if non-EU an institution) and thus jeopardise European unity.”Put in simple terms and quite bluntly, the EPO has truly corrupted the media. This in itself should be a massive scandal which everyone should speak about. Unlike propagandists from the Financial Times (FT) and other EPO ‘media partners’ (i.e. Battistelli puppets/mouthpieces), I never make money from EPO reports. I just do this because it’s the right thing to do. Battistelli’s puff pieces and recent campaigns at the Financial Times (of London) should raise many questions both inside and outside the EPO. It’s institutions like the EPO (once run and ruined by Battistelli) which discredit the EU (even if non-EU an institution) and thus jeopardise European unity. Earlier today we found this new article (modified screenshot above). It seems like Battistelli’s Kool-Aid is hard for people to drink/swallow, even if they don’t realise that the EPO PAID the FT for propaganda. I quite safely assumed that they (most probably) didn’t know this, so I told them after they had published this article. For those who don’t know what the EPO and FT conspired to achieve, see last week’s articles. All the gory details are in an article we published 5 days ago as well as a few articles from around that time regarding the EPO’s PR campaign with FT (including “FT Reports”, which magically enough started “following” me in Twitter a couple of days ago, having not enjoyed the attention). In 2017, the EU is going to open the Unified Patent Court. 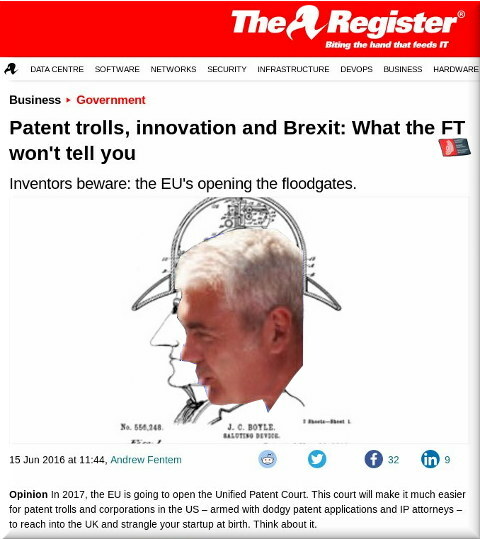 This court will make it much easier for patent trolls and corporations in the US – armed with dodgy patent applications and IP attorneys – to reach into the UK and strangle your startup at birth. Think about it. Last week the Financial Times reported )that two-thirds of patent cases in the US are now brought by “patent trolls”. In the last five years this has cost US startups more than $20bn in VC investment. Patent trolls don’t innovate or build anything, but specialise in suing legitimate innovative businesses. This activity is primarily enabled by the US’s massively dysfunctional patent system, a system that will rubber-stamp patent applications often with minimal vetting – resulting in a system choked with applications ranging from the spurious to the wildly ludicrous. Patent trolls then tour the world, armed with these “patents”, extorting money out of honest innovators and engineers. Although patent trolling is now increasing rapidly in Germany, Professor James Bessen of Boston University School of Law says that it is not currently a major problem in the UK – where fewer software patents and a “loser pays” litigation costs regime are real disincentives for that sort of “opportunistic behaviour”. We kindly ask patent attorneys, examiners etc. to pay careful attention to these arguments against the UPC. Like many arguments in favour of the UK remaining in the EU, these ones are based on logic and facts, thorough analysis rather than Battistelli propaganda, promises and fiction for those too lazy to examine it for themselves. In spite of the UPC, I am against Brexit, which probably helps demonstrate that my opposition to UPC is principled but not blind.